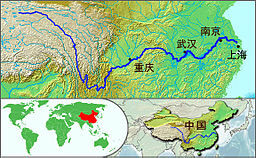 ↑ "Main Rivers". National Conditions. China.org.cn. 喺2010-07-27搵到. 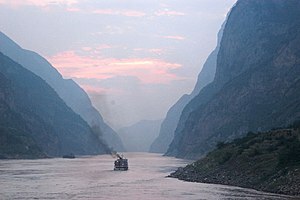 ↑ "Three Gorges Says Yangtze River Flow Surpasses 1998". Bloomberg Businessweek. 2010-07-20. 喺2010-07-27搵到. ↑ James F. Luhr (2009年). 《Smithsonian Institution Earth》. Smithsonian Institution. 第 232頁頁. ISBN 978-0-7566-6115-1. ↑ "中國日報：長江江蘇段成全球最繁忙水域 高峰流量每天3000艘次". （原先內容喺2015-06-15歸檔）. 喺2014-07-13搵到. ↑ 19.0 19.1 19.2 "新華湖北：抱團整治航道 湘贛鄂皖擬合力打通長江「中梗阻」". （原先內容喺2014年7月1號歸檔）. 喺2014年7月13號搵到.